Analyzing my working patterns is making me more aware of all the prep work I could do to make the actual creative work flow smoothly. While I've been using casting to make large numbers of multiples to shortcut assembly for some new jewelry, I also used the component approach for handmade metal clay work. 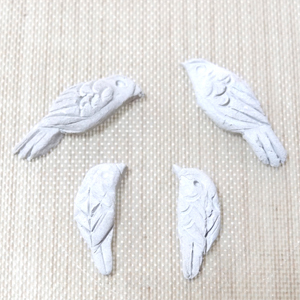 Just this week I've been working on remaking a pair of warbler earrings. First I cut out the windows with a template used many times before, then I pulled out the box of bits. Tiny leaves, of course, are perfect items to sit and make mindlessly, while listening to a good audiobook and waiting for the muse to appear. There's something so rewarding about pouring out a stack of leaves rather than having to detour and make what I need on the spot. 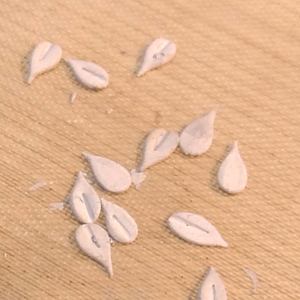 It's also more efficient and more accurate to roll out a sheet of clay, cut out evenly sized pieces, then sit and methodically form the leaves. Birds, too, get stockpiled. I can get into the flow when I sit and work on several at once. There's an art to making the matched pairs, facing both directions. I love having a flock of birds in various sizes and poses to choose from, but of course, all too soon they're used and I need to make more. I'm thinking I need to have a regular component day in my schedule to make certain that I have the components ready when I need them. All too often now, I find myself out of the desired piece. 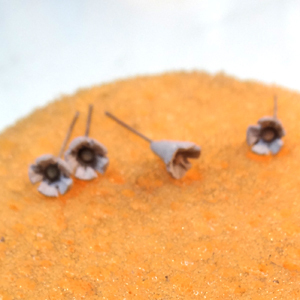 I also added tiny flowers to these earrings, and I tend to set up shop and make more than I need so that there will be some of those hanging around for next time as well. When the earrings are almost finished, I find myself flipping them over to add my hallmark on the back. 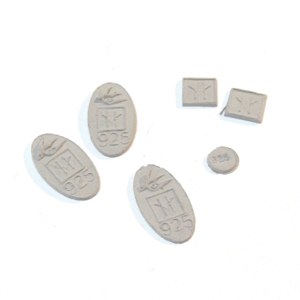 Usually, I prefer to use a small oval tag that has a tiny swallow, my initial logo, and the .925 quality mark. On some of my more open designs, the tag is too large and I use smaller individual initial logos and .925 marks. So today while the latest earrings are in the kiln, I'll be working on paperwork and making new components.